Hey all. I just finished a walnut table top. It’s roughly 3’x6’ and will have a metal base which my dad is going to help me weld up. The top is simply walnut boards doweled and glued together. It turned out quite nice… until I started using Arm R Seal Satin on it. I feel like I’ve searched everywhere on the web and I see other people with this issue, however, I really don’t know what I’m doing wrong, nor can I find a solution online. The first 4 coats went on relatively well. I made sure to sand in between each coat with 500 grit sandpaper and then wiped off the dust with a rag and a little bit of mineral spirits on it. I then folded up a small piece of old t-shirt that was clean and applied a thin coat of finish by wiping it on. I worked in sections on the table. I applied finish to one board of the table and then went back over it with long, light, smooth strokes. After about the 4th coat I noticed some very light streaking (lines) in some of the clear parts of the wood (without many grain lines). It wasn’t very discernible, but to me, I could tell it was there. So I thought I’d try to put on a 5th and final coat that was thinned about 25% with mineral spirits…. It streaked even worse! It looked horrible and cloudy. So after some more research, I decided to do one more coat without thinning and applying with a foam brush. I put on a very thick/wet coat and it looked great before it dried (was very even). After drying, the top coat looks pretty cloudy and has some streaking in it. I’m about at my wits end. Should I try sanding the table back down to bare wood and start over with semi-gloss? I’m wondering if it would streak less. I’ll attach a few pics but it’s kind of hard to see in the pictures. Any guidance or help would be very much appreciated. 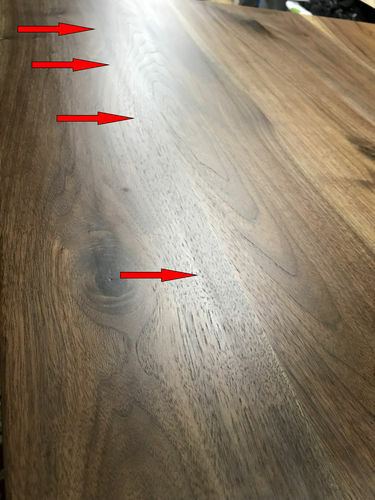 In my experience, streaking is a symptom of not putting a consistent layer of finish on the board which means your applicator was too dry or you wiped it too much as it was drying and created streaks. When applying the finish you should be able to look across the surface and see a uniformly shiny layer of wet finish. If not, you will get streaks when it dries. Generally, I will apply the first couple of coats with a rag and then switch to either a 3” foam applicator or else spray the last couple of coats for a consistent finish. I would probably sand off the finish and start over. Make sure you get down to bare wood or you will have an uneven finish. FWIW, I had a coffee table that took 7 tries to get the finish right on the top. It took that many times because I didn’t know what I was doing very well and I kept thinking I could short cut the process or that I had thoroughly sanded everything off. I would probably sand off the finish and start over. Make sure you get down to bare wood or you will have an uneven finish. FWIW, I had a coffee table that took 7 tries to get the finish right on the top. It took that many times because I didn t know what I was doing very well and I kept thinking I could short cut the process or that I had thoroughly sanded everything off. Thanks for the reply. I used a nice 3” foam brush for the last coat and it was a very wet, consistent coat (it looked like glass across the table when I applied it). I made sure not to backstroke or anything like that. I definitely haven’t short cut any steps in the process. I’ve tried to be very deliberate so that’s why this is so frustrating to me. I’m wondering if I can just rub out the finish with some 0000 steel wool and some paste wax. Does anyone know if that will remove the streaks? Or if I switched to semi-gloss, would this issue be as bad? Welcome to the challenges of finishing large flat surfaces – its why I spray them. You need to rub out the finish, if the film thickness is where you want it. If not, keep adding coats and scuffing in between. Wet sanding with say 800, use ms not water, will knockdown high spots. Then go over the whole thing with 1000 and 1200, then 0000 steel wool, then various auto paint polishes to get it to the sheen you want. Hopefully you dont go through the last layer of finish and get ghost lines. Poly is a great finish to own, but can be a pita to apply and get just right. You can also wet sand with the poly, then just wipe it off. Helps fill the pores. Before you give up and sand it back, I’d try one more coat mixed four to one, with Boiled Linseed Oil. (4 Arm-r-seal, one Boiled Linseed Oil). It smooths out the finish without accelerating the dry, which is what the mineral spirits did, IMHO. You didn’t mention sanding between coats. I always lightly sand w/ 400 grit sandpaper between coats. Another factor with satin finishes is the flatting agent that is in it, it has to to be thoroughly stirred or it settles to the bottom and as you work your way down the can you get more and more of it to the point that you are getting too much on your final coat. You didn t mention sanding between coats. I always lightly sand w/ 400 grit sandpaper between coats. Another factor with satin finishes is the flatting agent that is in it, it has to to be thoroughly stirred or it settles to the bottom and as you work your way down the can you get more and more of it to the point that you are getting too much on your final coat. The first 4 coats went on relatively well. I made sure to sand in between each coat with 500 grit sandpaper and then wiped off the dust with a rag and a little bit of mineral spirits on it. Also, I made sure to stir before and during the application process. I just sanded the table again and put on a light coat again (wiped) as I did with the first 4 coats that produced very little streaking. Hopefully this will reset things and the streaks won’t be as noticeable. I’ll update after it dries. I’m not an expert by any means, but I have always used Arm-R-Seal on all my projects because I find it easy and I hate finishing. The method I use is to apply very thin film with each coating, using folded pieces of cheese cloth. The porous cloth holds a sufficient amout of liquid to permit “lightly” wiping an area, and permits a quick dip to refresh the cloth and continue without previous areas starting to dry. I don’t sand between coats, I used to do so, but found that it wasn’t necessary – however I do lightly sand (typically with only 220 grit) before the last coat. As for your situation, consider that prior coats that streaked can show through the new clear coating. I’m not suggesting that you sand down to the wood, but as finishing expert Bob Flexner says in his book, “you need to finsh the finish”. By this, he is saying to rub out the finish for a consistent appearance, similar to rubbing out the painted finish of a car paint job. If I were you, I would first rub out the finish – after letting it thoroughly dry – with 4 O steel wool, being sure to remove the wax, and obtain a consistent looking finish across the entire surface. Then one last coat using the cheese cloth to leave a wet surface behind that readily blends with the next wipeing. That’s all I got, hope it helps your cause, good luck. Those streaks are pulls from applying too much pressure as you applied the finish. You then sealed them in with additional coats on top. They will never go away; if you want to get rid of them you have to sand the whole thing down. I know because it has happened to me. Thankfully on a smaller side table. It is also detailed on ARM-R-Seal side of the can and website. Ok, so after sanding with 500 grit and applying another coat as I did the first 4 wipe on coats, the streaking is minimal and you can’t really see it unless you’re looking for it. I may just call it good at this point. I think my next project I’ll try semi-gloss to help minimize the streaks. I know that large tables are difficult, so I haven’t lost all hope. I think I’ll wait a few weeks and then rub out the finish with some 0000 steel wool and some paste wax. I know it will give it a more semi gloss look but whatever. Haha. Sorry to read about your finish problem. I love ArmRSeal, but once in awhile it drives me nuts as well. For issues with streaking on large flat surfaces: only solution I have found that works 100% is to spray the final coats of ArmRSeal (I use a HF touch up gun). Using a foam brush with extremely light touch works on smaller surfaces. AND Avoid retouching the surface or you risk making new streaks. Semi-gloss/Satin versions use an additive to reduce the gloss. Besides the requirement to keep them stirred as the stuff settles to bottom,; If you apply many layers of non-gloss ArmRSeal, they can start to get “murky”/”Cloudy” and lose transparency. 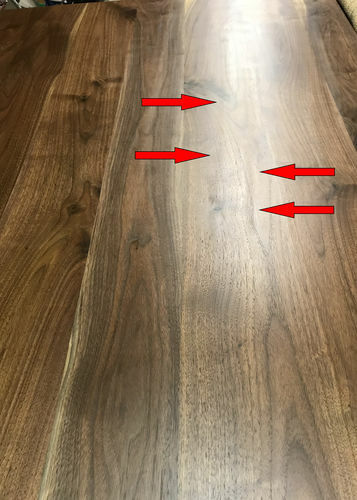 Suggest that if you use more than 3-4 thin wiped on coats, or 2 heavier brushed on coats; then best to use gloss version of ArmRSeal for base layers in order to maintain high level of transparency and not mask wood grain. Then use the semi-gloss/satin version to achieve the desired gloss level once you achieve the desired film build. As others have said, achieving a semi-gloss finish on ArmRSeal is easy: Once it has fully cured, buff it out with 0000 pad and some paste wax. I only buy gloss version of ArmRSeal any more, unless I have a complicated project where rubbing out every surface requires more time than another coat of finish. The latest versions of environmentally safe low odor MS can commonly have alcohol, water or other unwanted solvents in them. These unwanted solvents will wreak havoc on oil based finish (creating milky film, streaking, bubbles, etc). If you want to thin an oil based varnish, it is best to use a classic Gum Spirits Turpentine, Paint Thinner, or another type of pure 'White Spirit' Mineral Solvent .